For me, Auray had everything that Brest didn’t. It was relatively small, quaint and extremely underrated. It was the ancient Port de Saint-Goustan, with its charming 15th and 16th century houses that won me over immediately. Late that evening, we stumbled onto a bridge which spanned the town’s River Loch. From where we stood in our dimly lit surroundings, you could hear the sound of water gushing through the sluice gates below. Apart from the quiet banter emanating from a small eatery close by, the evening’s festivities looked like they’d ground to a halt. After all, it was 11.00 pm on a Monday night. Just then, Le Franklin caught our eyes and ears. It was a small bar and crêperie at the end of the short promenade. Although we were just out for a quiet, late evening stroll, we became seduced by the singing and raucous laughter from inside. The owner of the establishment was a rather quiet but easygoing fellow named Frank, or at least that’s what his customers were calling him. On reflection, it could’ve just been their sense of humour that saw “Frank” saddled with his moniker. The bar, however, got its name from Benjamin Franklin, who in 1776 arrived in the town en route to Paris, on his way to seek help from King Louis the XVI in the War of Independence. Once seated inside, we were treated to the best two hours of spontaneous entertainment you could imagine, which came in the form of some rather inebriated Irish gentlemen who were on a golfing holiday. Some of them had been coming to the town, at the end of May, for the last few years. Seated, or partially slumped, around two or three large tables, each member of the rowdy group, in turn, sang with such spirit and emotion that it made the hairs on the back of my neck stand up. We couldn’t believe they were golfers, not—at the very least—amateur choir singers, they were so good. As for their golf, some of the stories they later told us made us wonder why they were on a golfing holiday in the first place. Obviously, purely recreational. After a few glasses of Pelforth Brune, a bit of dancing, to the tune of one of the singers who insisted we follow his Elvis Presley impersonation, and a side-splitting conversation with an Irishman named James, we finally dragged ourselves into bed around two o’clock the next morning. We were exhausted, but we’d undoubtedly been treated to our best night’s entertainment so far. The next day was one of pure indulgence. Leaving the bike in the back of the Peugeot we headed for the picturesque French island of Belle-Île, home to Les Poulains lighthouse. Since seeing it for the first time, I’d fallen in love with Phillip Plisson’s breathtaking photograph, and it was a fait accompli that we’d pay the remote outpost a visit. 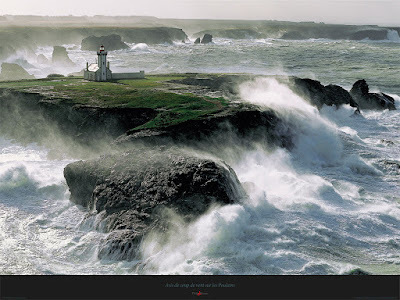 Taken during a storm on November 26, 1996, it captures the sheer ruggedness and imminent danger threatening the wild Brittany coastline. From Auray it was about 30 kilometres to the busy seaside town of Quiberon, where we caught the ferry to Belle-Île. The ferry ride itself only took about 45 minutes, but being a Tuesday there were fewer trips to the island than usual and the last one departed at a quarter to six, significantly earlier than we’d hoped. Nevertheless, we reckoned we still had about three hours to get the bus from the island’s port, Le Palais, visit the lighthouse and get back in time. Only a 30 minute bus trip each way, it sounded feasible. Well, that was the plan. But as we all know, the best laid plans of mice and men often go astray. What we didn’t account for was the ferry’s late departure from Quiberon and as a consequence, the bus not synchronising with the ferry. We now had just 15 minutes to visit the lighthouse before catching the last bus that would get us back to the port on time. Lighthouses being situated where they are, often on the tip of a promontory, the walk alone would take us at least 20 minutes, each way. I was gutted. This was more than just a lighthouse on a hill to me. It was a spiritual pilgrimage. It was like Collingwood being in front by 44 points in the 1970 Grand Final, only to painfully watch Alex Jesaulenko’s tumbling mis-kick dribble through the goals to seal the game for Carlton. Sometimes life just isn’t fair. Life is also a risk, so we decided on an alternative plan: we would simply try our luck at hitching a ride back to Le Palais once we’d spent time at the lighthouse. And it was well worth it, the sight being every bit as dramatic and spectacular as we’d hoped it would be. A little surprisingly, we passed two beautifully sheltered, almost hidden beaches on one of the approaches to the plateau. Here, you could spend an afternoon lying on the beach or swimming safely in the shallows. It was the last thing I expected to see given the mood conveyed in Plisson’s photograph. Of course, a further hundred metres around to the southwest, 4-5 metre high waves were hammering themselves onto the dangerous cliffs below. From a distance, the stark white lighthouse looked almost surreal, standing on its lush green plateau. But it wasn’t until we were right up close, experiencing the effects of the strong wind and surrounded by the rugged Atlantic on three sides, that we fully appreciated its remoteness. Mesmerised by the jagged cliff edges and white-capped waves that broke furiously across the reefs, we were reluctant to leave. But time was getting away from us. And at the forefront of our minds was our 5.45 pm deadline, not to mention the uncertainty of even getting a ride back to the port. Searching anxiously for a lift, around the near-empty carpark, we’d almost become resigned to spending a night on the island, without any spare clothes or accommodation. Just then, our saving grace appeared, out of nowhere. Whether she worked in one of the tourist offices on the island or was just visiting like us, we never quite found out. In any case, without hesitation, she offered to take us back to the port. And with hardly a moment to spare, we made it onto the boat. Later that evening, we undoubtedly enjoyed the best meal we’d eaten since we’d been in France. Back at the Port de Saint-Goustan, we dined at a restaurant called La Marie Galante, only metres from the boat moorings on the lock. What made it even more memorable was the warm service provided by the owners, who seemed to enjoy a conversation as much as their guests. Following dinner, we couldn’t help but gravitate back to our new Irish acquaintances, who seemed even more high-spirited than the night before. The two eateries were situated at each end of the promenade, but the noise coming from their end, more than 80 metres away, was deafening. Once we arrived, it was like meeting old friends, though a couple of them were looking a little worse for wear. And I don’t think the long day of golf was the cause. After sharing a few ales and hearing some stirring Irish ballads, we were invited to join in singing some Australian songs. We of course, sang with gusto. We felt very patriotic belting out a verse from what in another time could have been Australia’s national anthem, Banjo Paterson’s Waltzing Matilda. All of a sudden, out of nowhere, one of the men, Chris, started to sing the chilling words of an Australian anti-war song. It was Eric Bogle’s And the Band PlayedWaltzing Matilda, a song I have studied with my school students on many occasions. I can still hear him now as the words poured out with such empathy. It was sung exactly the way a song like that should be. After the odd tear and a few more ales we were done. We’d had a ball, but finished very late. Though we were well and truly burning the candle at both ends, it was worth it. Auray was definitely on our “bucket list”.